Someone I know posted this on Facebook. I’m pretty sure it’s not true, or at the very least, misleading. It is spreading quickly. Thanks for all of the truth you spread. Several readers asked us to vet emails that claimed Democratic National Convention organizers planned to bus 20,000 Muslims to Charlotte for the convention, or that the DNC would host a Muslim prayer service after rejecting a cardinal’s offer to bless the convention. Many of the emails link to a blog post or to an article posted on The Blaze, Glenn Beck’s conservative website. The Blaze article originally carried the headline, “DNC Announces 2-hour Islamic ‘Jumah’ Prayers After Rejecting Cardinal’s Blessing (And You Won’t Believe Who’s Invited).” The article has since been updated to reflect that Cardinal Timothy Dolan, New York’s archbishop, will be leading the DNC’s closing benediction. A Muslim group scheduled a prayer service titled “Jumah at the 2012 DNC” in a city park — not in any official convention venue — for the Friday afternoon before the convention. 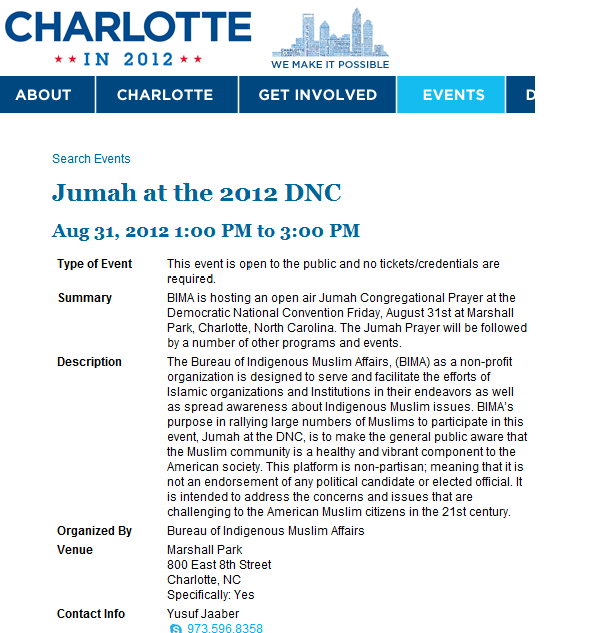 A group calling itself the Bureau of Indigenous Muslim Affairs advertised its prayer service on the website of the city’s host committee, Charlotte in 2012, not on the website of the DNC. Jibril Hough, a Muslim activist and BIMA spokesman, told the Charlotte Observer that BIMA also wanted to hold political parties accountable for issues that affect Muslim-Americans. Those issues include the Patriot Act, a law that expanded anti-terrorism surveillance, and the New York Police Department’s wiretapping program to monitor Muslims. Hough told the newspaper that he expected 20,000 Muslims to attend the prayer service as well as other BIMA-sponsored events scheduled in the days before the convention, including an Islamic issues conference and banquet, and a cultural festival. Dolan, who is archbishop of New York and president of the U.S. Conference of Catholic Bishops, will give the closing benediction on the final night of the convention — just as he did at the Republican convention. Easley, Jonathan. “Cardinal Dolan to Give Benediction at Dem Convention.” The Hill. 28 Aug 2012. Rauh, Grace. “Dolan Closes RNC with Prayer.” NY1. 31 Aug 2012. Cusido, Carmen. “Muslims to host events during DNC; up to 20,000 could attend.” 2 July 2012. Ritz, Erica. “Group Proceeds with 2-Hour Islamic ‘Jumah’ Prayers ‘At the DNC’ (And You Won’t Believe Who’s Invited).” The Blaze. 27 Aug. 2012. Blevins, Twana. “DNC to bus 20,000 Muslims to DNC Convention. Is this the ultimate deceit against women’s rights?” Patriots for America. 27 Aug. 2012. Charlotte in 2012. Convention Host Committee website. accessed 31 Aug 2012. Democratic National Convention. website. accessed 31 Aug 2012.